Gabriel Carl Ezekiel C. Lua of 8F is this October’s Reader of the Month. Gabriel shares, “my favorite book in the HS LRC is the Inheritance Cycle Series by Christopher Paolini. Out of the 4 books my favorite is INHERITANCE, the final book because of the suspense, thrilling events and revelations. The type of stories that Gabriel mostly enjoys are those in the line of adventure, manga and fiction. For him, HSLRC is able to provide these genres to him and more. 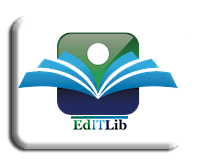 HS LRC has a vast collection of books that different kinds of readers will definitely enjoy. He added, “the librarians and staff are very kind and friendly. They are always ready to help a student find a book”. The Inheritance Cycle is a four book young adult series novel written by American author Christopher Paolini. The novels focus on the adventures of a teenage boy named Eragon and his dragon Saphira against the evil king Galbatorix. Originally, it was a three part series, thus the nam “Inheritance Trilogy, but while writing the third book Paolini announced on October 30, 2007 that the story was too complex to just fit in three books. Eragon is the first book in the series released in 2002, followed by Eldest in 2005. Brisingr was published in 2008 and the fourth title, Inheritance was released in 2011. Our Reader of the Month, Gabriel Lua chose Inheritance over the three other books because of its content. Here’s a summary of the book from GoodReads.com. Long months of training and battle have brought victories and hope, but they have also brought heartbreaking loss. And still, the real battle lies ahead: they must confront Galbatorix. When they do, they will have to be strong enough to defeat him. And if they cannot, no one can. There will be no second chances. The Rider and his dragon have come further than anyone dared to hope. But can they topple the evil king and restore justice to Alagaësia? And if so, at what cost?This is the much-anticipated, astonishing conclusion to the worldwide bestselling Inheritance cycle. 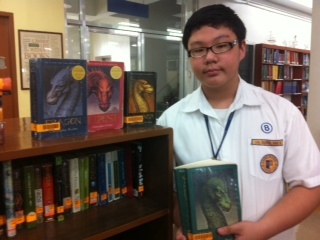 Tags: Brisingr, Eldest, Eragon, Gabriel Carl Lua 8F, Inheritance, The Inheritance Cycle, Xavier HS library, Xavier HS LRC. Bookmark the permalink.